As the lead UX designer at DTS, I sometimes took the liberty to independently work on app concepts, time permitting. One of these concepts was an app which focused on a single recording artist and featured built-in DTS Headphone:X technology. This concept represented a template design for an app that could be easily updated and republished for different artists, and still feel fresh and relevant while also having a low production cost. DTS had published a few such artist apps in the past, so I created this concept in case DTS decided to continue publishing artist-focused apps. This app concept didn't go any further, but it was well received. Posted here are screen mockups created by the graphic designer who worked with me on such projects. Note how this concept focuses on a faux artist named Katie Kilpatrick. Working closely with the graphic designer, we created a half dozen faux recording artists, giving each of them backstories, album art, and even finding stock photos to use as stills from music videos. This work became the foundation for a large library of such reusable UX assets that we could quickly and easily incorporate into app concepts and screen mockups for internal use. My Role: Lead UX designer and art director. Deliverables included concept designs, and wireframes. The graphic designer executed the high resolution screen mockups shared here. 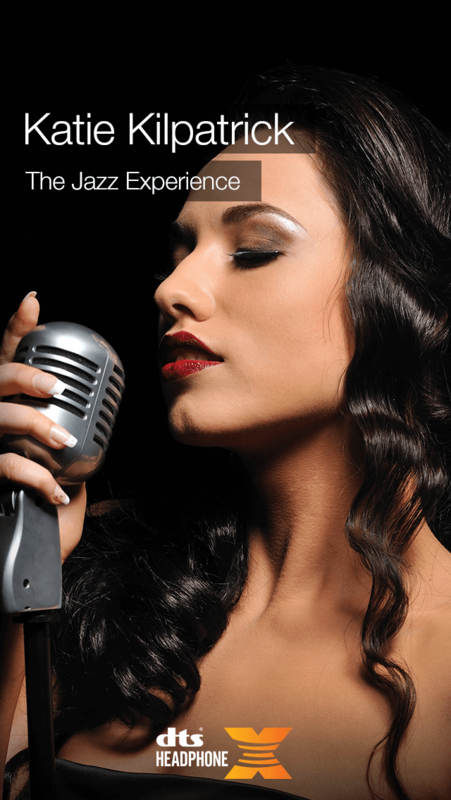 The Splash Screen for this concept app featuring the (faux) recording artist, Katie Kilpatrick. A blurred version of this image was used as the background graphic for most screens to increase their visual interest. In this concept, Katie is a world famous R&B recording artist, so a vanity app like this would make great sense. The key idea here is that the app is not only engaging for fans hungry for the latest info from their favorite artist, but that it's also easy for the artist to maintain by publishing content to a select few sources, such as a web site and social media. If the user scrolls up, she'll see more info, including an announcement about Katie's latest album and a link to view a demo video of DTS Headphone:X technology. An engaging design for an easy-to-code Now Playing Screen. The screen features the album art and the typical set of music player controls. Importantly, the user can tap on the album art to toggle on/off the DTS Headphone:X technology. 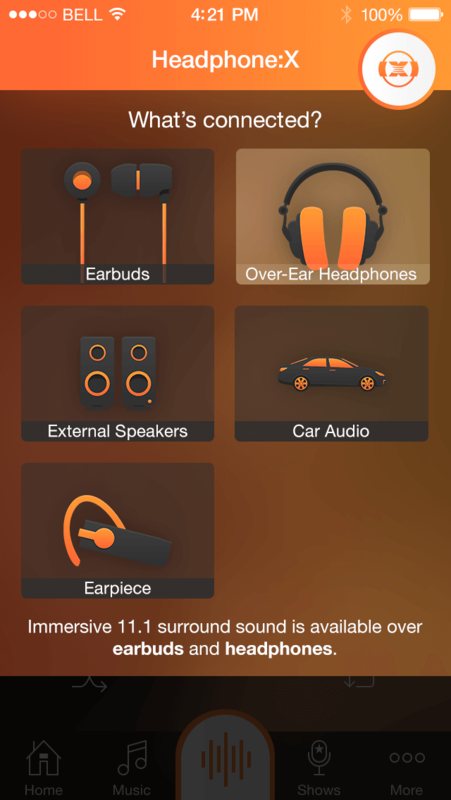 Touch the stylized headphone icon in the top right corner to view additional audio enhancement features. If the user decided to turn off the DTS Headphone:X immersive audio technology, then there would be a significant animation and visual difference between the two states. Note how the album art appears a little less vibrant compared to when DTS is on. 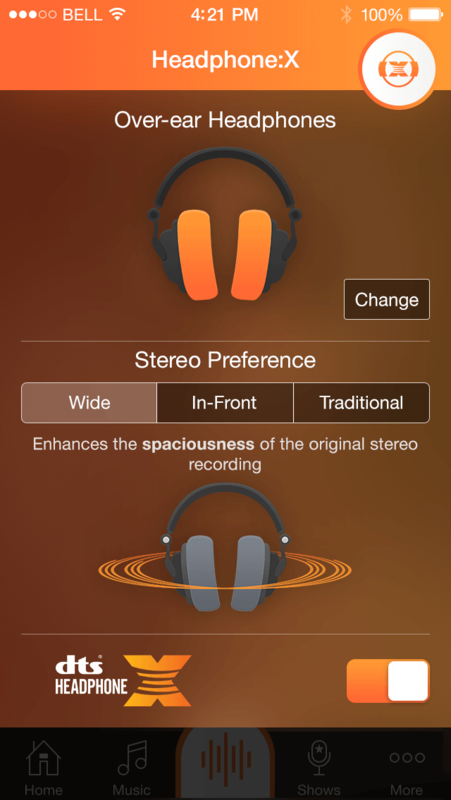 When the user touches the stylized headphone icon in the upper right-hand corner of the screen, then the app would display a slide-out options panel. This panel allows the user to identify which headphones are connected for the most optimal audio tunings, as well as try different stereo virtualization effects. Because smartphones can't automatically detect the headphone model when connected by 3.5 mm audio jack, the user must manually identify what is currently connected for the most optimal audio experience. In this concept, the app includes 5 generic audio tunings, as shown. When headphones aren't connected, a different set of audio enhancements would be active. 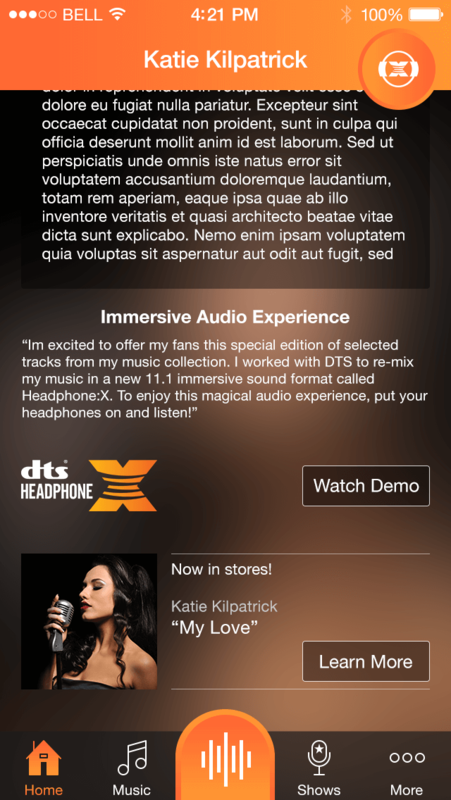 Similar to previously published DTS artist apps, this concept app would ship with a few free tracks, then the user would have the option of purchasing additional tracks. 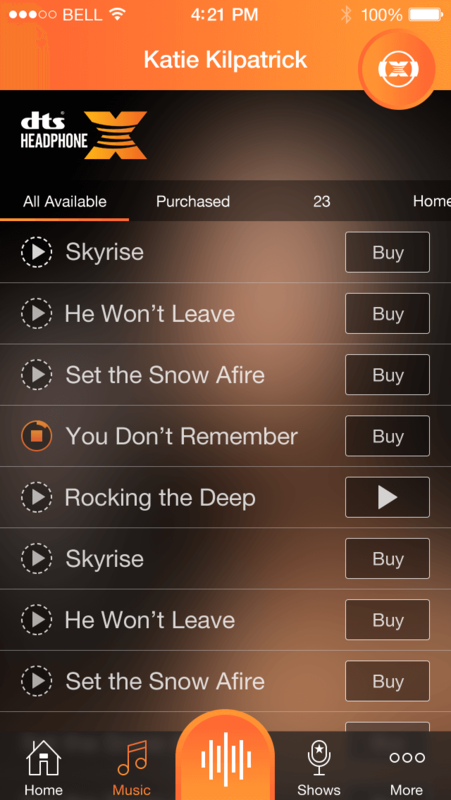 The benefit of purchasing through the DTS app would be that all tracks would be remixed in an immersive hi-rez multi-channel surround sound codec rather than the commonly available stereo mix. To help encourage engagement between the artist and her fan base, the app would feature a list of upcoming shows with the option to purchase tickets. This screen also features listings for performances on TV, YouTube, and more. The overflow screen shows additional ways for the fan user to engage with the artist and help drive additional incremental revenue. As artists don't constantly tour, the idea was that the artist could choose for one of these items, such as Pictures or YouTube, to replace the Shows tab on the navigation bar. This way, the artist could feature the channel where she was most active in creating content to help enhance the app's stickiness. ©Anthony D. Hand. All rights reserved.